Despite negative British macro-statistics, the pair GBP/USD was steadily growing last week, breaking down important resistance levels. It became known that British consumer confidence index fell to the level of –12 points; mortgage lending level was below the forecast of 68.6 points, declining to 67.7 points. Despite economic problems in EU, demand for the Pound continues to increase because investors do not feel confidence to the USD. Business activity indices in the manufacturing sectors of the UK and US are scheduled for the release today. It is also expected that the head of the US Fed Ben Bernanke will give a speech today. It is assumed that British PMI will increase, which will trigger the rise in the Pound. In the medium term ascending movement can reach the key resistance level of 1.6600. Do not forget that following long-term growth, the pair will inevitably experience correction. 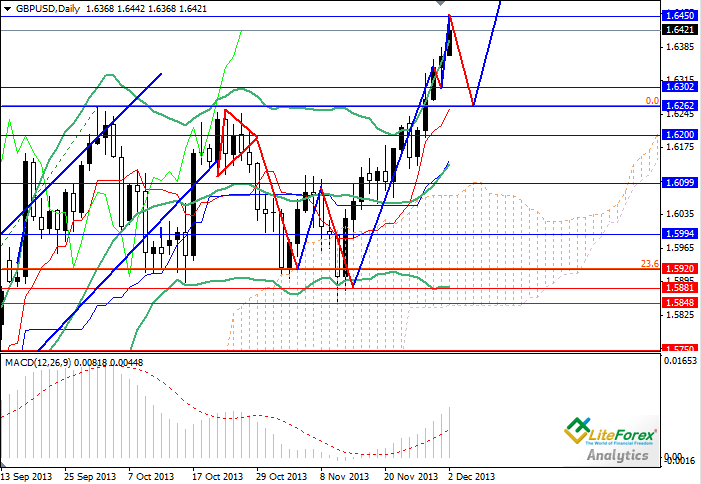 In the current situation it is advisable to place buy orders with profit taking at the level of 1.6600. In view of possible downward correction it makes sense to place pending buy orders at the levels of 1.6300 and 1.6270 with profit taking at the level of 1.6600.